Do you need additional information? 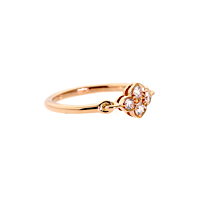 A classic Cartier flower diamond ring adorned with 4 round brilliant cut diamonds set in 18k rose gold. Ever since Cartier first started producing exquisite jewelry in 1847, its pieces have been described as flawless and eternal. Vintage Cartier jewelry is renowned for being delicate and intricate. The craftsmanship and detailed designs of Cartier jewelry feature the stones' stunning beauty without detracting from their elegance. Even the more streamlined Cartier pieces reveal unique details and thoughtful designs that put a luxurious twist on the classics. The range of Cartier jewelry offers luxury and class for all tastes. What makes this brand worth the investment is that you cannot help but feel immersed in sophistication when wearing any of the Cartier pieces. It is often difficult to discern between vintage Cartier pieces and the newer jewelry because the brand has maintained continuity their designs over decades. The new pieces are still fresh and vibrant but still encapsulate all of the quality and careful production that Cartier is known for. Safety and security guaranteed — we’ve always got your back. Opulent only sells authentic designer jewelry and watches. Have questions? Our team is available by phone and email.